Me – Oh yes, Jesus is MUCH stronger than Hulk! E – Then why did Jesus not break out of those ropes and nails on the cross if he were stronger than Hulk? Me – Oh that showed just HOW strong Jesus is. He made himself stay there so that he could make sure he did all he needed to do to get rid of bad things you and I do. Sometimes the conversations I have with my little kids teach me more than any seminary class I ever took! Absolutely beautiful to watch a four year-old process the power of Jesus unequaled by any superhero! God retains infinite power, resources and authority. Yet, God demonstrates throughout the Scriptures a desire to minimize the power distance between God and humanity as he continually invites people to work with him to accomplish his purposes. Jesus demonstrated power in the kingdom by turning the world’s systems upside down. On the Cross, we see the amazing power of Christ as he willingly places himself in a shameful and painful situation to pay the price for sin. Though the message may not be politically correct, sin costs both humanity and God BIG time which is why we must realize and teach others that we are all sinners in need of a Savior. Through dying, Jesus revealed his ultimate power in his choice to lay his life down for the redemption of the world. “The reason the Father loves me is that I lay down my life – only to take it up again. No one takes it from me, but I lay it down of my own accord. I have authority to lay it down and authority to take it up again. This command I received from my Father” (John 10:17-18). 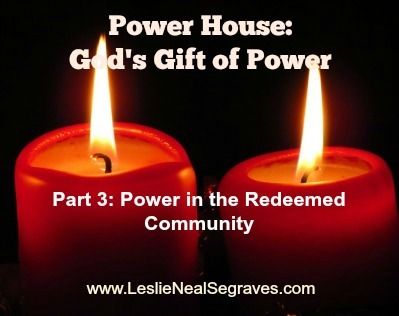 Jesus shares and releases power. He does not pursue power, nor does he classify power to certain groups of people based on education, ethnicity, age, or gender. This loving mission to fill, subdue, and make disciples pertains to the entire Church (which is later confirmed by the “empowering” Holy Spirit that permanently indwells and transforms believers). This sharing of power amazes me! Me – Oh, yes, Jesus is MUCH stronger than Hulk. E – Then why did Jesus not break out of those ropes and nails on the cross if he were stronger than Hulk? Me – Oh, that showed just HOW strong Jesus is. He made himself stay there so that he could make sure he did all he needed to do to get rid of bad things you and I do. E – Oh, so that’s how he forgives us right? Cool….Me – Oh, yes, Jesus is MUCH stronger than Hulk. E – Then why did Jesus not break out of those ropes and nails on the cross if he were stronger than Hulk? Me – Oh, that showed just HOW strong Jesus is. He made himself stay there so that he could make sure he did all he needed to do to get rid of bad things you and I do. E – Oh, so that’s how he forgives us right? Cool…. Wow – the conversations at bedtime and the beauty of watching a 4 year old realize Jesus is even stronger than Hulk. Truly Jesus demonstrates an “upside-down kingdom.” But for us to follow his model is not easy. Jesus’ use of power is counter-cultural to our fallen power structures and honestly not very comfortable for any of us to follow. Yet those with true and eternal influence are those who serve by laying their lives down (Matthew 20:20-28) – not those who seek to maintain status or position. During my doctorate research, as I studied power, I came across a book by Janet Hagberg entitled Real Power. She claims in Real Power that there are six stages of personal power in organization. In Hagberg’s view, true leadership only occurs in the latter stages. Her research showed that men and women get stuck at a lower stage of power where they most easily identify. Jesus’ leadership obviously moved to the later stages. Here I will simply relate the stages Hagberg believes men and women typically find themselves and relate them to the Fall. If we recognize our tendencies then we can ask Jesus to help us move beyond, so that we experience resurrection in all areas! Hagberg pointed out that the majority of women prefer power that comes by association (Level Two). People at this stage are dependent on their supervisor or leader and often do not prefer to make decisions because of insecurities that cause them to have a preference to follow. I believe the turning to a husband or boyfriend at the expense of following God with utmost allegiance coincides with the way some women seek to have power. It is the power through association. “If I have a boyfriend, then I am somebody” or “If I don’t marry this guy, I may never get married” or “I know God wants me to serve in the nations but if I marry ‘Bob’, I am sure ‘Bob’ will change his mind” or “My main goal in life is to get married since I was created to help a man.” Of course these statements all reflect a Genesis 3, post-Fall “turned” mentality (see previous discussion on t’suqah). Interestingly, the teachings of the Church can help women overcome these tendencies. Or Church teaching can reinforce the ingrained, Fallen predilections. May we use theology to encourage and release women into all that God desires for his glory and kingdom! The studies of Real Power showed that many men feel most comfortable in Level Three – power by achievement. Ambition, courage, control, greed, and egocentric behavior describes this stage. According to Hagberg’s research, this power centers on personal persuasion and requires loyalty. Again we can see the natural tendencies of many men who fall into the trap of power at the lower levels. Playing up pride and challenging one’s ego can certainly motivate. “Men, you have primary responsibility” or “Our houses and nation will fall without our men” or “Leadership = Male” or “Men are the prophets, priests, and kings” or simply “Men need respect.” These concepts and phrases increase the tendencies to grab and hold on to power (see previous discussion of mashal). Sadly, instead of promoting “power by purpose” or “power by wisdom,” the Church in seeking to increase male involvement, can actually limit men to Level 3 “achievement.” May we use theology to encourage and release men into all that God desires for his glory and kingdom! Can you see how Satan subtly deceives the Church? God desires to empower the whole Church to follow the path that leads to real power that can bless the world. God wants to change the world through us – both male and female. Join the conversation: Do you find yourself allowing the power God gives you to flow through you so that he can change culture both locally and globally? Do you find yourself stuck in stage 2, stage 3, or another stage?